AKA a typical day in high school. Text adventure games are hard to come by nowadays, but these types of games can make a powerful impact on players. Today, we are going to take a look at the upscaled rerelease of Wade Clarke's 2010 title Leadlight, titled Leadlight Gamma. This game can be purchased for a small fee of $4.00. If you're into text adventure games, this is the treat for you, and you can't beat the price of $4.00. Never mind, it's just a good deal! Alright, fans, let's examine the 3 Bs again! This time around, we are going to throw in a number equivalent (X/10) for those attracted to numbers. Buy: The game is so good that it receives our recommendation! Borrow: The game is decent, but there are several potential game-breaking aspects that drag it down, whether it's the game length or clunky gameplay. It's best to borrow the game from a friend, wait until the bugs are squashed, or rent it. Bury: This says, "Bury this game out of sight and out of mind." The game's not worth any price, as it's muddled by so many poor factors. Even a free game shouldn't be downloaded. The formatting is so fresh and so clean! Leadlight Gamma's environment is tense for the purpose of enhancing the dark plot, which conveys a creepy tone that can send shivers down players' spines. The game's genre is horror, so we expect a gripping tale anyway. Well, the story begins with 15-year-old school student Belinda Nettle, an aloof and asocial student, who falls asleep in her school's library. She later wakes in the midst of death when she sights the corpse of one of her classmates. From there, Belinda must unfold the mystery behind the dark and grim happenstances surrounding the Linville Girls' High School. At the beginning of the game, we learn a bit of Belinda's past, such as the fact that her father abandoned her, which led to her decreased self-esteem and self-awareness. Without spoiling the story, which is the prime component of Leadlight Gamma, I'd like to give a thumbs up to the overall plot. It's dark, depressing, and really makes you really speculate what's occurring at the school. At points, I pondered over Belinda's history and true self, even going so far a to conjure an elaborate theory behind the horrors at the school. However, I do feel that the story was a little lacking in a couple areas. There were some questions that were left unanswered that I felt needed to be covered. I wanted to know more about the ballet-admiring Belinda - to know the truth about her beyond the information we received in the game. I also wanted to know more about Belinda's mother and Belinda's schoolmates, since each character appeared so notable. In other words, I desire further connectivity with the story and characters, as is the goal of writing a story. As an author, you'd want to create a relatable, memorable experience. I probably would be further satisfied if a small biography for each character were written and placed in a gallery within the game. The gameplay is undoubtedly the best feature of Leadlight Gamma. The game is all about experimentation, exploration, and satiating your curiosity. Seriously, the idiom "curiosity killed the cat" couldn't be more fitting for Leadlight Gamma. The game focuses on typing, like your basic text adventures, but fixates on the two-word parser. For example, you combine a command offered in the game with a noun, i.e. eat cupcake. However, some commands you can use a single word to progress, like north, south, east, and west. Better yet, you can abbreviate most of the words, such in the case of directions: n, s, e, w. If repeating actions, like attacking, you can just simply hit enter to repeat your last command. To describe combat, it is a bit fun, though you have to majorly rely on RNG to determine the outcome of your battles. In most cases, I have a piece of advice: just attack any "living" thing in the game, because most everything will rip your face off if you try to reason with them. There is a certain probability that your blunt and sharp stats will increase in skill for every blow you deal, and you will have a variety of weapons at your disposal, ranging from hockey sticks to toys. As mentioned previously, a good portion of the difficulty lies in your luck. I often found myself reloading my saves after dying or if I suffered a big enough blow that the next fight will surely slaughter me. Though I love experimenting with typing, my favorite aspect of the gameplay is, by far, the death traps. Though I wanted to avoid these traps like the plague, at the same time, I was curious enough to find out all the manners in which I could die. Wade's creativity shines in the methods of death, and a lot of them are completely unexpected. One death was so creative that it involved something you could wear; if you wore the item in the particular area, you'd die. The puzzles are none too difficult, but they can snag you in a few areas. Experimentation is key and you will have to put your creative muscles to work, but sometimes you still may end up stumped. Fortunately for players, Wade provided a hint decoder file with the game, so you'll be able to decode hints to 22 questions. Not all secrets and strategies will be revealed in the hint sheet - only the ones likely to stump you. Overall, the game is fairly short, but it offers replayability through the score system, where you can always achieve the highest score possible. Finally, the aesthetics. 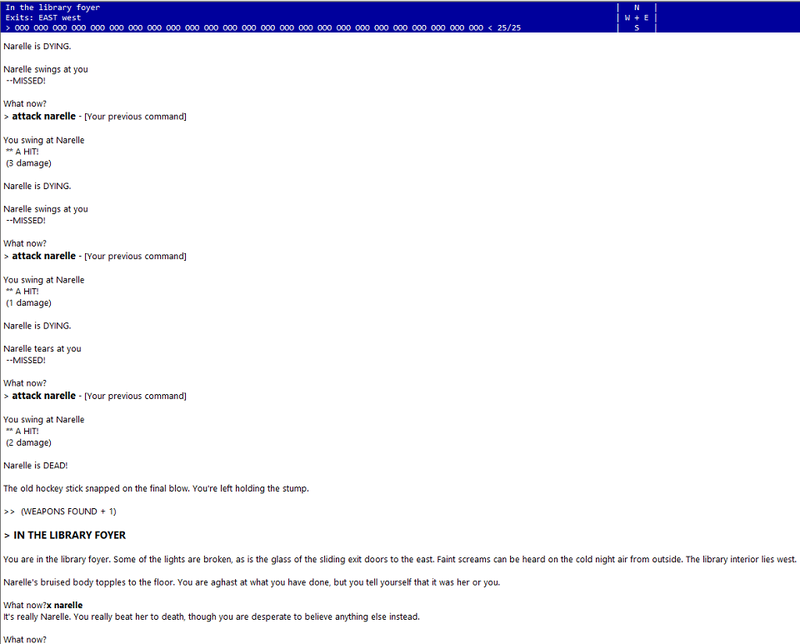 I will admit the aethestics are lacking, but it is a text adventure game. Keep that in mind. The placement is clean and proper, and there is a map thrown at you in Leadlight Gamma to help track your movements. The story, commands, etc. are all on the left side, and the map is elegantly placed on the right. 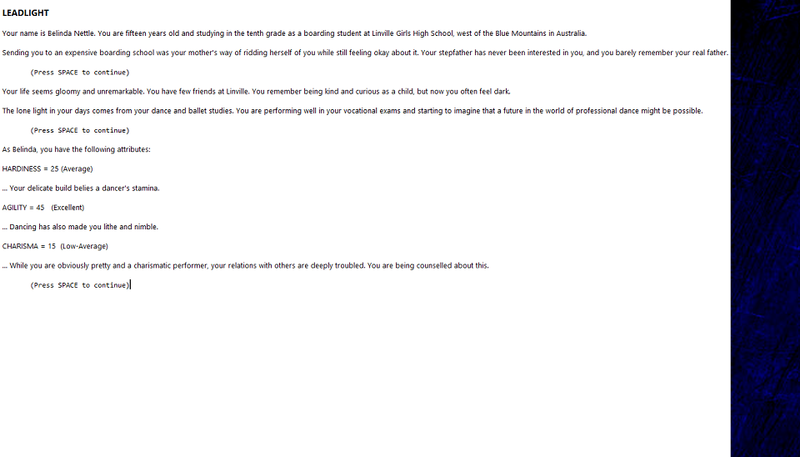 I would give an A for cleanliness and readability, especially since the formatting within the actual text is neat. I personally dislike walls o' text, so to read Leadlight Gamma in bite-sized lines was refreshing. As for sound, within the game there are no sound effects, but that doesn't truly impact the overall story. However, I feel that certain sound effects would enhance the game, such as the whoosh of a breeze, the sound of glass shattering in certain instances, etc. You can, however, play the original soundtrack while you are playing the game. All of these songs are extremely mesmerizing and parallels the atmosphere of the game. Particularly, I love Paul Pitman's take on Chopin's Waltz in A Flat Major, Op. 34, No. 1. 6. Paul Pitman - Waltz in A Flat Major, Op. 34, No. 1. Tracks 2 and 7 are probably my favorites out of the OST. They both exude a sense of decrepit hope - a feeling of inevitability. Track 2 focuses more on a twilight experience, tranquil and solemn, yet paranoid, whereas track 7 seems to exhibit an air of caution and bewilderment. One slight mistake and you're shaking hands with death. You can listen to the full soundtrack here. I do wish, however, that the songs would be implemented in a way better than through the music jukebox setting. You can play the tracks via shuffle and order, but the music, although fitting, seems a bit detached from the game itself. Another negative is that there is no repeat after the playlist finishes, so you have to manually restart the playlist if you want to listen to the OST again. It's a bit immersion-breaking, but not too terrible. And here is my final score. Yay! Took me a lot of moves, though. Overall, the game is a text adventure win in my book, especially for $4.00. 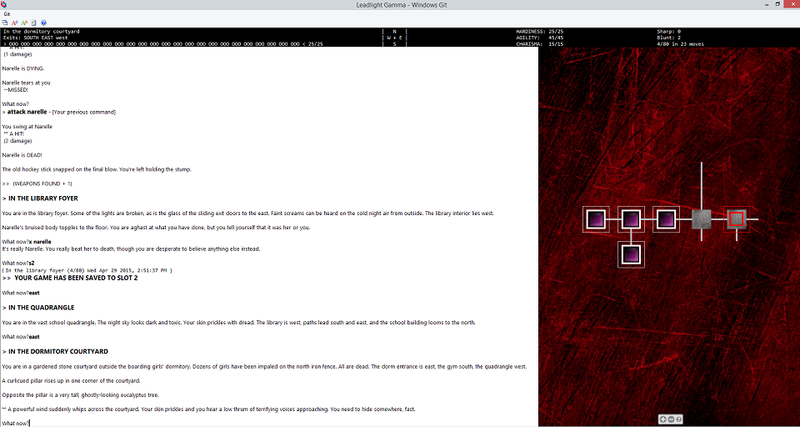 If you're a fan of old-school text adventure games, Leadlight Gamma is surely recommended. You'll receive a creative horror story stuffed with puzzles, surprises, and tons of varied death. Dark, vivid, and fitting for a horror title. The difficulty is just right. Sometimes you feel stumped, but other times it takes a couple moments of trial and error to progress. Quite a bit to discover despite the overall length of the game. Myriad of objects to play with. Characters fall flat. Not enough background for any of them. Music isn't truly embedded into the game.